Soy comes from soybeans. Soybeans or soya beans are legumes which grow throughout much of the world and constitute one of the world's major food crops. The beans can be processed into soy protein, which is a powder; soymilk, which is a beverage that may or may not be fortified with extra calcium from the soybeans; or soy fiber, which contains some of the fibrous parts of the bean. Soy are turned into a wide array of foods, including tofu, miso, soymilk and tempeh. Soybeans have been in use as a food crop in Asia for around 5000 years, but didn't make their way to the United States until the 19th century. In the modern world, the vast majority of soybeans are either turned into oil or used as feed for livestock or human consumption. There are two major types of soybeans cultivated these days -- the yellow and black varieties. There is no significant nutritional difference between the two. There are a number of different ways soybeans may be prepared for human consumption. They may be eaten sprinkled with salt and boiled, in a form usually referred to by the Japanese name edamame. They may be turned into soymilk, a process involving soaking them in water, then grinding them and boiling them into a milky substance. The curds from this soymilk may then be pressed into blocks of tofu, in a process similar to that of making cheese from dairy milk. Whole soybeans may also be cooked slightly and then fermented using vinegar and the fungus Rhizopus oligosporus to make tempeh. The leftover soy flour from extracting the oil from soybeans is also used to create textured vegetable protein (TVP), which is often used in meat substitutes. The health benefits and concerns of soybeans are hotly debated by leading nutritionists and physicians. Soybeans contain a full range of amino acids and a high protein content, making them an ideal supplemental source, particularly for vegetarians and vegans. Many people hold that soy should not be fed to infants in any form, as it may lead to allergies, but this is contested by other physicians and nutritionists. Soybeans are also one of the most genetically-modified crops, with a full 80% of soybeans grown on Earth having undergone some sort of modification. The most famous of these modifications is the Roundup Ready soybean, which can be sprayed with the weed-killer Roundup and survive. The genetically-modified status of soybeans is a cause of concern for many who tout its health benefits and believe genetically modified foods to have possible health risks. For this reason, many soy products proclaim that they use non-GMO (genetically-modified organism) soybeans. Over 100 million metric tons of soybeans are produced globally each year, with the United States as the number-one producer. Argentina and Brazil also play a large role in the production of soybeans, and there is concern that their increased use of land to cultivate soybeans threatens the rainforest. Soybeans are a source of protein and they can provide all the essential amino acids. The essential amino acids are the ones that cannot be synthesized by our body and hence, have to be acquired only from foods. Generally, animal proteins are known as a source of complete proteins, as they contain all the essential amino acids. On the other hand, most of the plant food sources cannot supply all the essential amino acids required by our body. But, one of the most important soybeans nutrition facts is that they can provide complete proteins, due to which they are an ideal food for vegetarians or vegans. Protein content accounts for about 40% of dry soybeans, while carbohydrates and oils account for 35% and 20% respectively. The remaining 5% is ash. The outer hull (dry outer covering) of soybeans is a rich source of dietary fiber. It contains both soluble and insoluble fiber. Soluble fiber can have several important health benefits like lowering cholesterol and blood sugar, while the insoluble fiber can be beneficial for digestive health. It has been found that soluble fiber can also lower the risk of developing colon cancer. Apart from proteins and carbohydrates, soybeans can provide significant amount of iron, vitamin C, thiamine, folate or folic acid, calcium, magnesium, potassium, zinc and manganese. 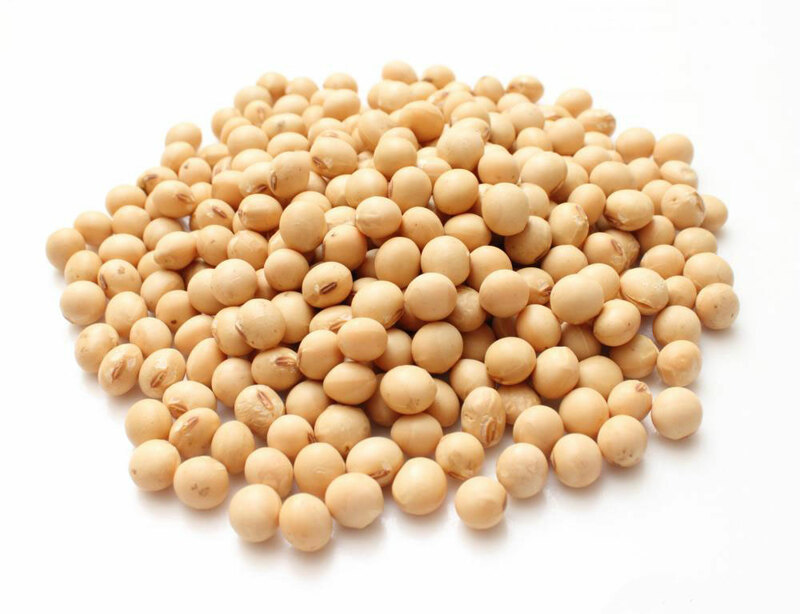 1 cup or 256gm of raw soybeans usually contains about 376 calories, 33.2gm protein, 28.3gm carbohydrates, 17.4gm fats, 74.2mg vitamin C, 1.1mg thiamine, 504mg calcium, 166mg magnesium, 1587mg potassium and 9.1mg iron. On the other hand, 172gm of dry and roasted mature seeds contain almost 776 calories. Soy nuts are a type of snacks, that are actually roasted soybeans. Calories in roasted soybeans or soy nuts can also be very high. 30gm of soy nuts can contain about 140 calories. Dry and roasted soybeans or soy nuts are made from whole soybeans, which are soaked in water and then baked to make them crispy. Soybeans are an important source of not only proteins, but carbohydrates, fats, and many essential vitamins and minerals. So, they facilitate normal growth and development in young children. They can help manage the level of cholesterol, blood sugar and body fats, when consumed in adequate quantities. They are often regarded as an ideal food for those trying to build muscles. They can be of immense help for preventing a number of health problems, including atherosclerosis or hardening of the arteries and complications related to the heart. Even people suffering from diabetes can receive significant health benefits from consuming soybeans. Oil obtained from soybeans is very rich in essential fatty acids like linoleic and linolenic acids. Both are very important for human health, as they help regulate blood pressure and facilitate the absorption of vital nutrients. So, soybeans are an extremely beneficial food that can provide almost all the important nutrients required for human growth and development. They are quite popular for being a rich as well as a cheap source of proteins. Soy is used for high cholesterol, high blood pressure, and preventing diseases of the heart and blood vessels. It is also used for type 2 diabetes, asthma, lung cancer, endometrial cancer, prostate cancer, and thyroid cancer, as well as preventing weak bones (osteoporosis), and slowing the progression of kidney disease. Other uses include treating constipation and diarrhea, as well as decreasing protein in the urine of people with kidney disease, improving memory, and treating muscle soreness caused by exercise. In foods, soy is used as a milk substitute in infant feeding formulas, and as an alternative to cow's milk. Soybeans are eaten boiled or roasted. Soy flour is used as an ingredient in foods, beverages, and condiments. Consuming soy foods such as soy protein is SAFE. Taking soy dietary supplements also seems to be safe for most people when used short-term (up to six months). Soy can cause some mild side effects such as constipation, bloating, and nausea. It can also cause allergic reactions involving rash and itching in some people. Soy beans or soy naturally contains toxins like trypsin inhibitors, hemaglutinin, phytic acid, and phytoestrogens. The presence of these anti-nutrients give rise to several side effects or negative effects on consuming soy products. However, one should know that these are only potential dangers that can occur only when soy products are taken in very large amounts regularly. Let us have a look at it in detail. Trypsin inhibitors in soy products interfere with protein digestion and can lead to disorders of the pancreas. The Hemaglutinin is responsible for clumping of red blood cells together to form clots which can obstruct several body functions. One of the other dangers of soy occurs due to the presence of phytic acid or phytates. It inhibits the absorption of certain essential minerals like calcium, magnesium, zinc and iron. Soy is believed to have a greater adverse effect on the thyroid gland. The phytoestrogens in soy products can cause hypothyroidism and autoimmune thyroid diseases in people. One of the biggest dangers of soy milk for women is that it is believed to contain phytoestrogens which works in similar way as estrogen (a female hormone) that can aid in menopausal symptoms and may even lead to reproductive disorders. As mentioned above, soy products inhibit the absorption of calcium, this in turn leads to increase in the requirement of vitamin D.
Soy foods also contain considerable amounts of aluminum that can lead to several kidney diseases if consumed in large amounts. Those advocating for soy should also be aware of the potential dangers of soy proteins. It is proposed that soy foods inhibit the benefits of other foods and nutrients in the body. Over the years, as the popularity of soy has held fort for the above mentioned benefits, researchers have also discovered several ill effects of soy which offset the gains. Excessive consumption of soy apparently seems to contribute too much estrogen into our bodies. So, eating too much soy might make men a bit more 'in touch with their feminine side'. Other things associated with soy milk is that the estrogen level spike in the male body leads to growth of breasts in men. However, no one should think that eating soy will make a man a homosexual. That is stupid. Homosexuality in fact only happens by a free and deliberate choice. It is a lifestyle. Other more disturbing researches show that over-consumption of soy in infant and children may contribute to more than just increasing effeminacy in those inclined to it. Researchers claim that too much estrogen in men might make them think and act like women and slowly make them infertile. So it seems like over-consumption of soy is terrible for men on account of the estrogen levels. But it must be terrific for women right? Wrong. Like a rationed and rational consumption of soy helps avoid cancer, over-consumption can lead to stimulation of growth of cancerous cells in females.